Yes!! I finally will get to see Brandi Carlile when she comes to town. Plus Hozier, Maggie Rogers and more. 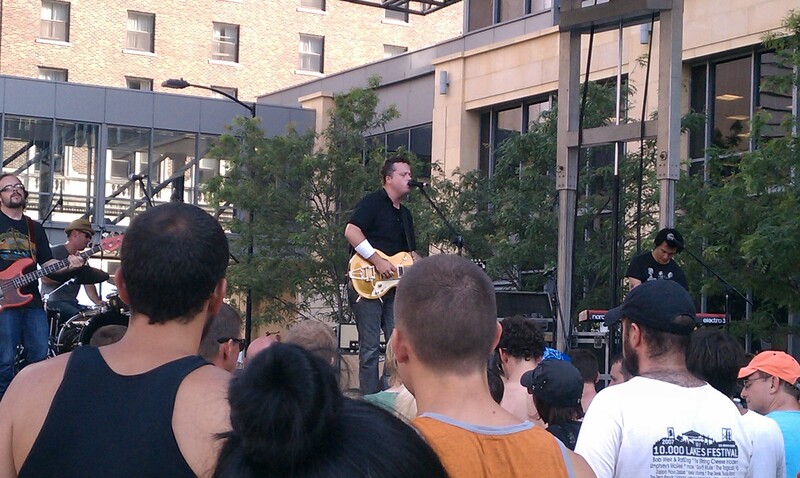 (We may miss Jason Isbell on night #2 because of a prior comittment.) Anyway, here’s the just announced lineup for the 3-night (the first 3-nighter) Hinterland festival in St. Charles, Iowa, about 35 minutes south of Des Moines. August can’t come soon enough!! I clicked on my computer at 10:01 this morning to get early bird tickets to this summer’s 80-35 Music Festival in Des Moines July 10-11 (rumors flying that among the performers will be Wilco and Jenny Lewis. That was enough for us) and secured them ($49 each vs. $59 each regular, which is pretty darned good for almost two days of live music). Ten minutes later I returned to the site and the early bird tickets had flown the coop. That was fast. Good to hear. click here for tickets. The lineup will be announced April 7! Many lucky fans have already snatched up their 80/35 tickets. Our super discounted tickets and VIP passes sold out in under 10 minutes! The still-awesome deal of $59 two-day tickets are now available viamidwestix.com. We have clearance to announce the lineup on Tuesday, April 7. We can hardly contain ourselves — so excited for you to see who will make 2015 one to remember. We know those of you that take advantage of the early discounted tickets attend every year and that’s why you buy before we even announce the lineup. So THANK YOU, and we look forward to being able to release our lineup with you! Brandi Carlile in Des Moines this July! The great news is singer Brandi Carlile, one of my favs, will be performing downtown on the riverfront this summer in Des Moines. The bad news is we’ll be out of town when she’s here (July 7 at the Simon Estes stage.) But don’t let that stop YOU from going ! 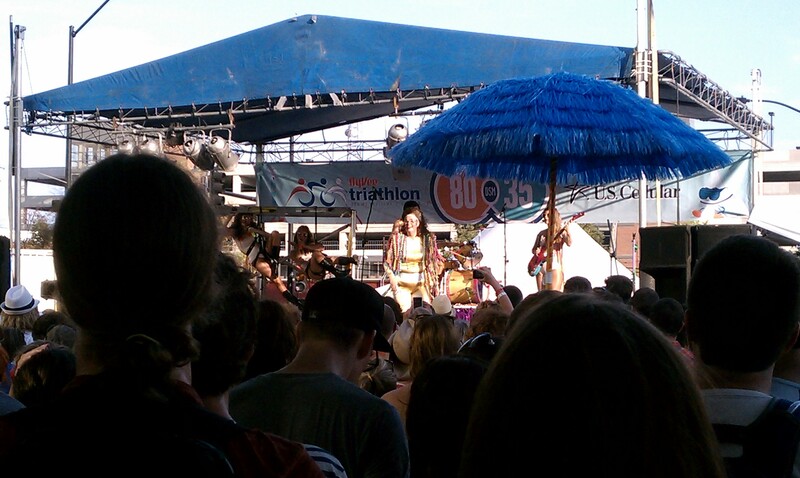 OTHER NITEFALL ON THE RIVER PERFORMANCES! 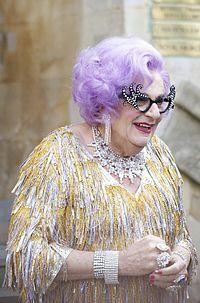 Dame Edna at the wedding of Prince William and Catherine Middleton, April 2011. We spent much of Saturday resting up after Friday night’s exertions at the 80-35 Music Festival in Des Moines and bracing for more blazing hot temperatures upon our return to the festival. Which is one reason we didn’t get to the festival until 5:30 p.m. – but it was still hot then, although not as hot as the 100 degree temp on Friday. By 8 p.m. though, winds started blowing in and cooling us all down and by the time Death Cab for Cutie appeared on the main stage at 9 p.m. the weather was surprisingly pleasant. Amen for that. Our favorite band of the day was Jason Isbell – hands down – a talent guitarist and singer from Mussel Shoals, Alabama who formerly was with the Drive-By Truckers. I only wish he could have played longer – and on the main stage. He seemed frustrated too that he could only play a less than one hour set. Leslie and the LYs was as nutty as expected – Leslie reminded me of Dame Edna Everage, a comedy character popular in England who is played by Australian comedian Barry Humphries. Leslie isn’t a drag queen, as far as I can tell, but with her puffed up hair and goofy outfits (a gold bodysuit that didn’t offer much breathing room during the heat) and goofy backup singers (including a skinny drummer in what appeared to be a women’s bathing suit who went around and around on a turntable stage) she had the same panache. Leslie’s sheer gutsiness and goofiness was charming – and her rapping showed some real musical talent. We were less impressed by Death Cab – their music was catchy but monotonous – so we moved onto watch the scene at a nearby free stage where hundreds of kids were dancing or hula hooping or whirling strings adorned with lighted balls to electronic dance music. Much more interesting. Wowee zowee – it was sooooo hot at 80/35 yesterday – temps past 100 degrees – but we had so much fun, especially when the Avett Brothers played at 9 p.m. on the main stage. I’m feeling the pain a bit today though – after hours of dancing atop a card chair amidst thousands of other dancing fools. And I’m thinking we’ll have to wait awhile before plunging back into the heat and music for the second day of the festival since it’s again near 100 today. I did just find out that there are two rain tents you can run through to cool off near the 80/35 stages downtown. (We also enjoyed hanging out briefly in the air-conditioned lounge that the restaurant Proof transformed into for the festival. More below! Make it rain: Visit our two rain tents located outside of Americana on Locust St., just west of 13th St. Festival goers can run through to cool off. H2O keeps the dehydration away: There are two free water filling stations: inside the paid area just outside the VIP entrance and in the free area on Locust St. and 11th St. Wellmark Blue Cross Blue Shield is providing free reusable water bottles, located at the water filling stations. You can also bring in one empty water bottle, camelback or other empty plastic container and one factory sealed water bottle. Get out of the sun: There are various locations around the festival grounds to get out of the sun, including the Nuclear Energy Lounge by the Kum & Go Stage. Lawn chairs and umbrellas are allowed, but only in designated areas towards the back half of the main stage grounds. Safety first: The First Aid tent is located on 12th St. just south of Locust St.
what to see/hear at 80/35 Music Festival in Des Moines this weekend. – then onto the main stage at 9 p.m. for – Avett Brothers. 7 p.m. Leslie and the LYs on the HyVee stage – this Ames singer’s song “Hydrate Gyrate” could become the anthem of this year’s festival, given the weather forecast. 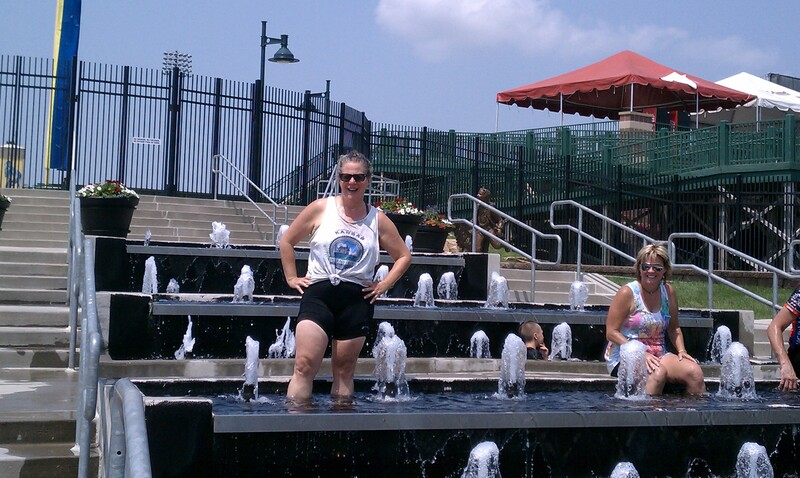 We were not the only bikers who climbed into the fountain for some much needed relief. We’ll be looking for more of the same this week since the heat is supposed to linger through Saturday – making for the hottest week of Iowa weather since 1989. We’ll be looking for ways to cool off during a bunch of outdoor activities this week – including the Yankee Doodle Pops concert at the state capitol, our neighborhood parade and picnic and concert by David Zollo, a friend’s party (they have a pool!) and especially 2 days of the 80-35 music festival. Wish us luck.